Roksan TR-5 S2 speakers aim to improve on five-star K2s | What Hi-Fi? The Roksan K2 speakers were consistent five-star speakers, and now they've had a thorough update with the new TR-5 S2 bookshelf speakers. The S2 speakers retain the same drivers as the K2s, so the ribbon tweeter that helped set the originals apart from the crowd is here, as is the custom-designed bass driver. What is new is the internal design and the crossover, thanks to the use of new voice coils, upgraded components and a fresh printed circuit board. Sonically, Roksan says the new speaker aims to retain the detail and openness of the original, but with "a more controlled, faster sound". We liked the original enough to award it five-stars on more than one occasion, so we have high hopes for the S2s. A bi-wirable speaker, the S2 measures 37 x 19 x 28cm (HWD) and weighs 8kg. Roksan lists the sensitivity as 88dB at 8 ohms. 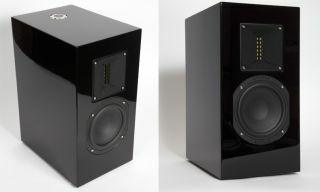 The Roksan TR-5 S2 is available now in black gloss and costs £995.